With the Sony Rolly now available in Sony Style stores nationwide, things will change. The television? Dead. The internet? Deader. The fireplace? Surprisingly, effective competition if the Rolly gets too close. Americans will take to staring at this little dancing 2GB MP3 player for hours on end, sacrificing heat, food and clothing to make due with the $400 price tag. We're sorry to be the bearers of bad news, but now that the wheels are in motion, it's too late to stop. SONY'S ROLLY ROLLS INTO THE U.S.
SAN DIEGO, May 20, 2008 - For those who want to experience music through movement, Sony's Rolly entertainment player, a palm-sized, egg-shaped device that rolls and spins like it's dancing to the music, is now available at Sony Style retail stores nationwide. Spawned from Sony portable audio technology and innovations in artificial intelligence, along with the company's design and entertainment legacy, this device provides a unique combination of music, motion and fun. "Rolly has the ability to attract your attention as soon as you turn it on," said Brennan Mullin, vice president of marketing for audio at Sony Electronics. "It's a tremendous example of what can happen when entertainment and technology merge." Made for producing superb audio quality, Rolly features 180-degree, horizontally opposed stereo speakers. As a result, listeners can enjoy high quality sound from nearly anywhere in the room. Sound reverberates from the surface the device is placed on, whether on a desk or on the floor. With a digital amp for high sound quality and speakers with neodymium magnets, powerful audio performance is delivered from the compact unit. With built-in robotic technologies, the device is designed to move its small arms, shoulders and wheels—six moving parts—to the beat of the music. With about 700 colors in its repertoire, lighting adds to the impact of the motion. The Rolly device comes with choreography for three songs: "Also Sprach Zarathustra" (theme from "2001 - A Space Odyssey"), Avril Lavigne's "Girlfriend" and Earth Wind and Fire's "Boogie Wonderland." It can be powered up to play music and dance immediately right out of the box. Two additional tracks have been included to demonstrate how motion can be integrated into the listening experience. To choreograph an original routine, the unit comes with Rolly Choreographer software. Motions can either be created automatically by the software for a specific song, or for a creative twist, you can create customized choreography for your favorite music. Once choreography has been created, the software simulates how the device will move so you can preview the dance moves on a PC before transferring the routine to the unit. After creating original dance routine programs, users can share choreography with others in the Rolly Go forum. Using the choreographer software, motion files can be uploaded or downloaded online from this site. Found at www.sonystyle.com/rolly, click on the Rolly Go icon to access the community and see what others have created. The device's simple, clean, cable-less design lets it move freely on smooth surfaces. It is easy to change songs or control the volume by turning the wheels while the unit is on a surface or holding it in your hand. Shaking the device switches its music play to shuffle mode. The player also contains Bluetooth® technology for wirelessly streaming music from a compatible PC or mobile phone. With 2GB flash memory, the player can store up to 520 songs for songs of an average of four minutes in length at 128kbps in the MP3 format. The battery life allows up to five hours of music playback and up to four hours of music and motion together on a single charge. The player supports non-secure AAC and MP3 formats. Sony's Rolly entertainment player and Grammy™ -nominated R&B singer/dancer, Omarion, have teamed up for a dance off between man and machine. Omarion is known for his dance style and choreography that blends popping, locking, waving and break dance movement. 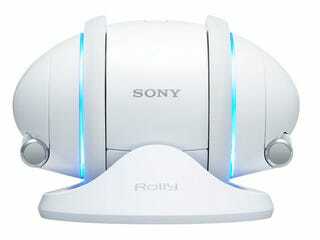 You will soon be able to watch a dance off between the device and Omarion at www.sony.com/rolly. The Rolly device comes in black and white and is available online at www.sonystyle.com/rolly and at Sony Style stores for about $400.